Wirelessly stream iOS videos, music, photos, etc. to any Windows PC. X-Mirage 2.0.2 was available as a giveaway on April 8, 2016! 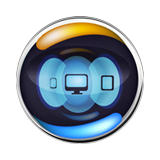 X-Mirage for Windows is a professional AirPlay receiver for Windows users. It allows you to wirelessly stream iOS video, music, photo, etc. to any Windows PC. Also you can mirror multiple iPhone, iPad and iPod screens to the bigger Windows display or record iOS screen activities with sounds, as well as voiceover via Microphone with one click. How would you improve X-Mirage 2.0.2? wirelessly stream ANDROID video, music, etc. Next FlipBook Maker for Windows, a feature rich flipbook software application on Windows, that helps you to convert PDF/images to stunning Flash&HTML5 flipbooks with a truly immersive page turning experience. It provides a variety of customizable flipbook templates and animated swf scenes. Next FlipBook Maker Pro for Windows is a professional flipbook software for both professionals and novices to create rich interactive Flash&HTML5 flipbooks. It also provides an easy way for you to embed multimedia to flipbook pages. Add buttons, links, images, local video, YouTube video, music, chart etc. to your flipbook to add interactivity in seconds. Publish flipbooks to HTML5 for mobile browsers, Flash for desktops and laptops. Information to perhaps a dumb question please. Does the program ALSO need to be installed on the device you want to mirror? I'm not real familiar With Apple but it time I learned. There is a Mac version. However, it is not covered by the giveaway. I purchased this after the last time it was given away. It worked perfectly for months, but on upgrading to Windows 10, it bailed. I spent several months in the forums trying to get info which never came to configure it correctly. But after months of forum posts they listened and we now have the 2.20 installer which works perfectly with Windows 10 64bit. It has lots of uses, such as being able to record your face time calls and telephone call via the PC, and also allows us poor Apple product users the ability or the closest thing to it, of not having to have iTunes installed for everything. It's great for recording you iTunes videos or music straight of the device on to the PC in MP4 or MP3. It's also useful for professionals to record how to guides for easy distribution on the net. I recommend this to everyone here. Get this and you won't be needing the Apple TV junk just to AirPlay anymore. This keeps happening to me with GOTD downloads. I download the app and run setup and I keep getting messages that the file is corrupt and to download it again and I do and keep getting message file is corrupt. This keeps happening to me with GOTD downloads. I download the app and run setup and I keep getting messages that the file is corrupt and to download it again and I do and keep getting message file is corrupt. What's up with this?????? I second that, it has only recently started happening - disabling avg worked for me. Michael Ewanits, Just to add to the other comments: Are you extracting the files from the zip file into another folder? Are you running the exe file from the unzipped folder, as an administrator? I am extracting the files from the zip file into another folder and yes I am running the unzipped folder as administrator. The past 3 or 4 times I tried to install a GOTD file it would say the the file is corrupt and so I would download it again and it would say again the file is corrupt. I have not tried to disable my security software, which is Kaspersky so I don't know if that will work or not. I am running windows 8.1 Pro if that makes any difference. Should I disable Kaspersky before I download or wait till I try and install it???? RichU, I am extracting the files from the zip file into another folder and yes I am running the unzipped folder as administrator. The past 3 or 4 times I tried to install a GOTD file it would say the the file is corrupt and so I would download it again and it would say again the file is corrupt. I have not tried to disable my security software, which is Kaspersky so I don't know if that will work or not. I am running windows 8.1 Pro if that makes any difference. Should I disable Kaspersky before I download or wait till I try and install it???? I downloaded and installed this the last time it was offered here. It actually works quite well. It was able to mirror both my Iphone and Ipad without a hitch. If you are like me and don't have (and don't want to buy) an Apple TV device, then this is a good way to mirror your Iphone/Ipad. You may need to enable a firewall or AV exception, but aside from that, this works as described. I had actually purchased version 1.x, whatever it was and couldn't ever get it to work. So I downloaded 2.02. You MUST remove any previous versions. Even after that, go to your task manager (windows) and insure any old versions are not running. COMPLETELY remove any old versions on you computer and install 2.02. It runs silently and seamlessly. Then... activate Airplay on your IOS device (Iphone/Ipad). Great giveaway today. Thanks. Installed ok win 10 64bit, kept loosing connection with my Iphone5 (up to date) when playing/ selecting different music videos. These were genuine itunes music videos downloaded via '12Days' app ( Back in the good old days when Itunes believed in Santa, 12 days of assorted freebies). I then tried to mirror the Iphone playing clash of clans, there was a delay at times between the iphone's actions and the mirrored image, probably due to complex graphics. I'm not saying it won't work well for all users, it just isn't very good for me and my setup/ needs. If the idea of streaming videos etc appeals to you, but can't get this giveaway to work, there is a company who has a collection of free products for win/mac/ios/android, I am not happy to name them here as I don't believe it is right to do so on this page. Thank you anyway, but this time not a keeper, keep up the good work GAOTD team. Giving a thumbs down due to the fact it does not work with Android. Big downfall in my opinion. Apple uses Airplay, Windows uses Miracast, Wireless Display, Remote Desktop, & Continuum, while Android can use a proprietary service, depending on brand, &/or use Miracast, while there are also apps for Airplay. Sony's gotten into the act with a recent update to their PS4, & you can do similar with the Xbox One. So if you've got an Apple handheld [iPhone, iPad...] & want to use Airplay, with a Windows device as the receiver instead of another Apple product, give X-Mirage a try, installing it on that Windows device [e.g. PC, laptop...]. If you have a Android device you'll have to see what the hardware supports. If you have a Windows device I'd suggest joining the Insider program for 10, as this stuff is under active development, with some features just released & more coming. Note that you may want or need Wi-Fi on your PC for some of this stuff -- the X-Mirage FAQ wasn't completely clear *to me* on this point. x-mirage[.]com/x-mirage/faq.html . You can get USB dongles for Wi-Fi or wired Ethernet for ~$10 [you'll get more bandwidth out of your handheld if/when you can use a wired connection], while the very often recommended Microsoft Wireless Display Adapter will set you back ~$50. Also note that you may find yourself limited by the horsepower of the processor in your handheld device, though I'd expect this to be more an issue with older &/or cheaper Android hardware, e.g. I have a [now older] Galaxy Tab 2 7, & it will not handle full HD video or display, period, so anything I send to a larger screen or PC etc. is going to be lower rez, whether that's a game or video. Apple uses Airplay, Windows uses Miracast, Wireless Display, Remote Desktop, & Continuum, while Android can use a proprietary service, depending on brand, &/or use Miracast, while there are also apps for Airplay. Sony's gotten into the act with a recent update to their PS4, & you can do similar with the Xbox One. So if you've got an Apple handheld [iPhone, iPad...] & want to use Airplay, with a Windows device as the receiver instead of another Apple product, give X-Mirage a try, installing it on that Windows device [e.g. PC, laptop...]. If you have a Android device you'll have to see what the hardware supports. If you have a Windows device I'd suggest joining the Insider program for 10, as this stuff is under active development, with some features just released & more coming. Note that you may want or need Wi-Fi on your PC for some of this stuff -- the X-Mirage FAQ wasn't completely clear *to me* on this point. x-mirage[.]com/x-mirage/faq.html . You can get USB dongles for Wi-Fi or wired Ethernet for ~$10 [you'll get more bandwidth out of your handheld if/when you can use a wired connection], while the very often recommended Microsoft Wireless Display Adapter will set you back ~$50. Also note that you may find yourself limited by the horsepower of the processor in your handheld device, though I'd expect this to be more an issue with older &/or cheaper Android hardware, e.g. I have a [now older] Galaxy Tab 2 7, & it will not handle full HD video or display, period, so anything I send to a larger screen or PC etc. is going to be lower rez, whether that's a game or video. In this Win XP SP3 there was no restart during the installation. And getting the code is strange. Be aware, this installer restarted my pc without asking first, so you will loose anything you haven't saved. Also, it install's the Bonjour service (part n parcel really with software for Apple products) to run constantly so you may wish to tweak your services settings afterwards to stop it doing so unless you are going to use it constantly. Otherwise, nice little bit of kit, Thanks. Be aware, this installer restarted my pc without asking first, so you will loose anything you haven't saved. Also, it install's the Bonjour service (part n parcel really with software for Apple products) to run constantly so you may wish to tweak your services settings afterwards to stop it doing so unless you are going to use it constantly. Otherwise, nice little bit of kit, Thanks. Reminis, installed it on 3 machines and no forced reboot.